Gene Tierney wears the 1940s look with all natural ease. 1940s makeup is one of the most “vintage” looks and rather simple to recreate. There was a push for all things natural, unlike the 1930s and 1950s, which favored reshaping eyebrows and contouring the face. 1940s makeup enhanced natural beauty with just a few tools. During the war, European women dealt with huge cosmetics shortages, as petroleum and alcohol–some of the main ingredients in makeup at the time–were used for the war effort. When makeup ran out, women turned to home remedies to substitute, such as using beetroot juice to stain lips and petroleum jelly to darken lashes and shape eyebrows. In the United States, cosmetics continued to be manufactured throughout the war and were seen by the government as a morale booster for the busy women on the home front. Women were encouraged to wear makeup all the time to hide sadness and attract men, even while at work. Athletes even wore makeup. Color films had a big impact on the market, as women could now imitate the shades worn by Hollywood starlets. By 1948, between 80 and 90 percent of women wore lipstick, two thirds wore rouge and a quarter wore eye makeup. The makeup look of the 1940s is classic and sophisticated, but very simple to recreate. Faces were flawless and fresh looking – the look was all-natural, never ‘painted on.’ Less was always better than more, which was good since most women were surviving on less and less in the early years. Although this all sounds very simple, a woman’s 1940s makeup routine could take a while – the five minute face did not exist! First, the thick foundation had to be applied and blended. Women were encouraged to shape their face with lighter and darker shades of foundation – a darker shade could be used to ‘fix’ a large nose, big forehead or square jaw. A lighter shade on cheeks could make them look plumper. Next came the eye shadow. After that, moist rouge was applied. This could also be used to shape the face, but had to look natural. Then powder was applied with a huge velour or wool puff. It had to be pressed into the face and was applied heavily (as in the face would be covered in powder!). Then the excess had to be brushed off the face with a powder brush. If the moist rouge wasn’t enough, a powdered one would be applied over the face powder. Next came the eyebrow pencil, mascara and (finally!) lipstick was applied. Save it, print it, pin it, share it. Foundations weren’t the same as they are today, and not many shades were available–most had a pinkish hue. They were also much thicker and creamier–none of our lightweight liquid foundations were around. Face powder was essential and matched the skin tone while keeping the face matte. Foundation was not only used to ‘correct’ a woman’s color, like it had in the past, but it also helped powder to cling to the face (it couldn’t really be used on bare skin without falling off). Foundation and powder were often extended all the way down to the dress or blouse line since the shade most likely didn’t match the face perfectly to make it less noticeable. Tip: Apply a light coat of baby oil (mineral oil) to your face before applying a foundation. Powders should match your natural skin tone as much as possible. Light shades keep a woman looking fresh and youthful, while a slightly bronzed shade adds a sun kissed glow, popular with movie stars. Almost all makeup lines carried a sun kissed color or two. If you are over 40, your skin is prone to yellowing, in which case a powder with a pink tinge will work better for you. To apply, use a puff to dust your face all over and then brush from the neck up to the forehead. Only brush down once to finish and smooth out face fuzz. Tip: A fluffy face puff makes a difference. Don’t use compressed powder with a flat pad for early 1940s looks. Pan-cake compressed makeup came out in the mid 1940s with big success. To women who could afford it, it provided more coverage applied in less time. Just remember to always brush up, never down. Rouge (blush) applied to the center and brushed up and out to the cheekbones. Blushes (called rouge at the time) were used sparingly and weren’t available in many shades. They were mostly pinkish shades of peach and coral. Moist rouge (cream) was used often to give a natural color and was blended into the foundation. Compressed powders were also brushed lightly on the cheekbones to give a natural rosy look. Rouge isn’t completely necessary to the ’40s look, and going without it will still achieve the right affect. Tip: Rouge cream is best but if you can’t find any use a light matte lipstick instead. Apply to fingers then dab and dot on checks and rub in till blended. Eyebrows were worn fairly natural-looking. Arches were well-groomed, but eyebrows weren’t tweezed to be extremely thin–only the stray hairs were removed to create a natural arch. They were further defined with eyebrow pencils that were slightly darker than the hair–a line was drawn at the top of the brow and the hairs below were left soft. Most women didn’t even use an eyebrow pencil, instead just dabbing on a little petroleum jelly to smooth the hairs into an arch. Personally I like this look best for day wear. Very little makeup was used on the eyes. During the day, most women wore a light coating of dark brown or black mascara. Some only used Vaseline brushed on the lashes. Mascara came in liquid, paste or cake with a small lash brush. Adding a drop of water or spit to cake makeup gave it a thick build up. 1940s eye lashes were a bit on the heavy side, compared to today’s look. Mascara was applied to both the upper and lower lashes. Eye shadows could also be worn, but in very neutral colors, and usually only for evening looks. Eye shadows should match the eye color (not compliment it like we do today). Blue-eyed gals should use blue-grey shadow, green eyes used grey shadow and brown shadow was used on hazel, brown or black eyes. For evening, eye shadow colors were sometimes matched to the dress, but often silver or gold was added to a regularly used shade. Eye shadow was worn in a single color (no smoky eyes or contouring here!) from the lash line all the way to the brow and blended for an evening look and just the top eyelid for daywear. Eyeliner wasn’t used at all until the very end of the 1940s and then only applied to the top lash line. Eyeliner was believed to be too “fake” looking in most cases. The lips are the most important part of the ’40s face. Lipstick was thought to keep women’s spirits up during wartime. Lipstick was red, red and … red! Shades could be bluish or orange-y and everywhere in between, but lipstick was always red and always worn. In the fall shades became a little darker, and were a little bit lighter in the spring. Steer clear of bright pinks though – they weren’t worn until the ‘50s. Lipstick was generally completely matte–women were told to moisturize lips before applying lipstick as well as add a dab of oil on top of the lips if the color was too bland. They also blotted lips with a tissue after each lipstick application. By 1948, lipstick pencils had appeared and were being used to perfectly outline the mouth before lipstick was applied. Women tried to plump up their pout using lipstick if their mouth was ‘too thin.’ They went for an even look – lips should be the same size on top and bottom. This plump look was called the Hunters Bow lip, coined by Max Factor, and made popular by actress Joan Crawford. For thin lipped women, over drawing the lip line was needed to achieve the right shape. Lip liners certainly helped with this in the late ’40s. Actresses Lauren Bacall and Ingrid Bergman didn’t bother to overdraw their naturally thin lips. They preferred the natural beauty look as did most women in the 1940s. 1940s overdrawn red lips. Full on top and bottom. Tip: Start your draw line either with pencil or pointed lipstick at the peak of your cupid’s bow and draw outward to the mouth corners. Fill in the top lip with lipstick. Rub your top and bottom lip together to transfer the color. Touch up the bottom lip if its not even with the top. Revlon nails. Red, red and more red to match the lipstick. Fingernails were always neatly trimmed and filed into long oval shapes. Nails were kept slightly shorter during wartime work for safety. Cuticles were also always kept immaculate, trimmed and moisturized. Nails were almost always painted in various shades of red, although pink, coral, mauve, rose and burgundy were also popular colors. Nail polish colors often came in a set with matching lipstick. A clear coat topped all nail polish for durability. One fingernail fad was to leave the half moon white spot at the base unpainted – this was a classic fingernail style of the 1920s to 1940s. Seeing a manicurist was a frequent expense for women throughout the decade. vintage reproduction makeup. Highly recommended! Today it won’t take much makeup to finish off your ’40s look. Just paint your nails red, put on plenty of face powder and black mascara, define those brows, put on a flattering shade of red lipstick, and you’re good to go! It is not nearly as complicated as most online tutorials show you. TIP: Purchasing modern makeup to create a 1940s look is not easy. 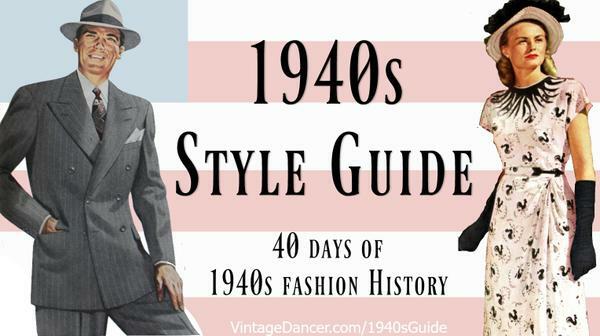 Most modern colors are shiny, glittery, bright, and otherwise unsuitable for the natural ’40s look. You will want to find makeup that is pure matte – no shine. makes a good matte line, and some of the newer organic makeup lines also have good choices. and Elizabeth Arden were original 1940s brands and thus still have a few colors and products in their modern line (like Pan Cake powder). is another line that recreates vintage makeup colors and cosmetic cases from original formulas (highly recommended). They have a guide to which of their makeup work forMy personal favorite pure Red lipstick is L’Oreal Infallible Le Rouge Lipstick #308c (aka Target Red). Finding the right color and makeup brand for you will be trial and error. To get more tutorials, I would normally suggest turning to a book or website on 1940s makeup. However, in my opinion, there are few quality sources for the natural everyday women of the ’40s. Most online videos and tutorials lean on the modern or “pin up” side of makeup and use a boat load of extra makeup products and tools never known in the 1940s. Use them, as a suggestion, but stick to the style explained here and you will be glamorous in no time. by Lauren Rennells is a great book to have on hand. The looks are a bit more movie star than day wear but the modern techniques are still helpful. I love her Vintage Hairstyling book too. – This original beauty book form the 1940s is the one resource I highly recommend when you are ready to take your makeup application to the next level. The book covers more details about choosing colors, application tips and tools, and my favorite: how to apply makeup for my specific face shape. After following all the directions in this book I was able to create an even better 1940s look with makeup, specific for my face shape, skin type and coloring. This is why going to a direct source from the 1940s is MUCH BETTER than any “inspired” makeup lesson can achieve. Only $9.99 as a digital download.